Sharon Considine remembers when she was asked to come onto the board of Coronado Hospital, now Sharp Coronado Hospital, in early 1988. She was then the owner of the popular Mexican Village restaurant in the 100 block of Orange Avenue and also a board member of the Coronado Chamber of Commerce. She and Mary Sandermann, wife of the late Fritz Sandermann, one of Coronado Hospital Foundation’s founders, were the only women on the board and Considine was one of the youngest people in the room by two or three decades. She next proposed the idea of making the gala an annual event — a concept that the board rejected, voting 9-2 against the idea (only Considine and Sandermann voted in favor). Considine then left the meeting, tendering her resignation. But she received a phone call later that afternoon; the board had reconsidered and agreed to let the duo organize a second gala. “It brought in $12,000, which was a lot of money in 1989,” Considine said. 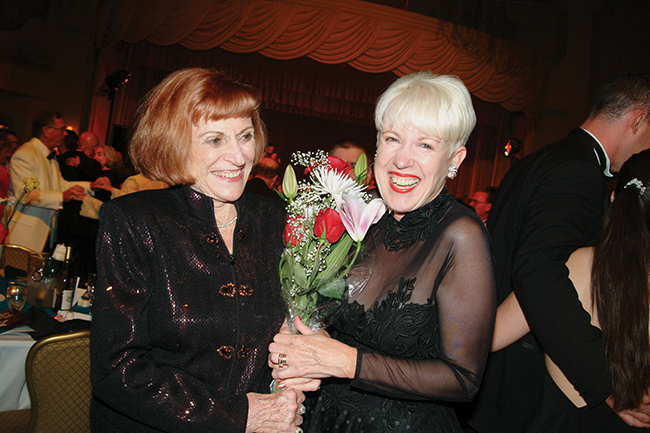 Considine and Sandermann had not known each other prior to their hospital committee work, but a deep friendship developed, and over the years, they co-chaired many of the early hospital galas, reuniting for the 25th anniversary ball and again for this year’s Around the World gala, which will include dancing to the Mar Dels and feature a live and silent auction. While this will be the last time they chair the ball (Sandermann is 92), Considine plans to be a committee member well into the future. Sandermann continues her foundation board service as an honorary member. Susan Stone, Sharp Coronado Hospital’s CEO, still refers to Sandermann as the hospital “administrator” and solicits her feedback on projects regularly. 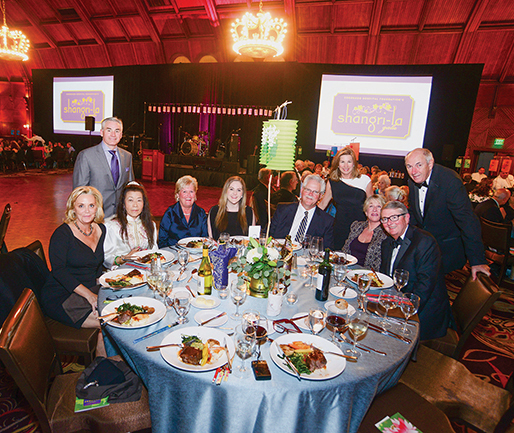 Held every year at Hotel del Coronado, the galas have progressively made more and more money, through sponsorship, live and silent auctions, and generous donors; achieving a total of some $12 million over the past 30 years, that has helped such hospital initiatives as the Sewall Healthy Living Center, the Mindful Café and Healing Garden and the Payne Family Outpatient Pavilion. 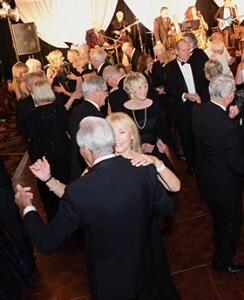 “The Hotel Del has been a fabulous partner,” Considine said, adding that several of the gala attendees come from out of town and stay overnight at the hotel for the event. For the past 10 years, the hotel has hosted a kickoff party each March for the gala. “It all goes to show how important our local hospital is to Coronado and its neighboring communities,” she said. 1) Start with a committee of at least 15 people. It’s mostly women who get involved, but men should be welcome, too. With a large committee, expect talents to emerge and let people do what they do best. You’ll need someone who has design talents. And be sure to include people who are movers and shakers in the community who can help secure sponsors and underwriting. You’ll want people who aren’t afraid to ask for donations and others who prefer to work in background, assembling auction prizes and setting up the room. 2) The entity you are raising money for has to be on board and want you to do it. It really helps if a specific need can be targeted because people naturally want to help when their assistance is needed. They want to feel they are making a difference. 3) Have a different theme each year. We had so much fun with our third gala, “Moonlight and Magnolias,” where we constructed artificial magnolia trees with moss hanging down at the entrance. Themes take off in all directions — the menu, décor, music, and even what attendees wear — we expect some wonderful international garb at this year’s “Around the World” gala. 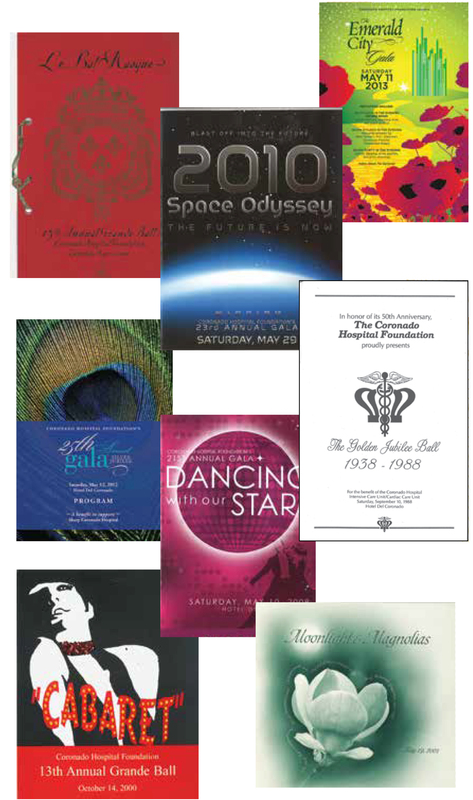 4) Be creative with live auction items. One year a committee member donated her house for a Mexican fiesta, and Pepe, my chef at Mexican Village, prepared all the food. Chefs often are willing to do this; it helps them spread their reputation throughout a community. Also, lots of folks have frequent-flyer miles and will donate them, which can be paired with a destination to make a great auction prize. And of course, with a nonprofit, the donation is tax deductible. Some of the craziest auction prizes will raise thousands of dollars. Guests enjoyed dancing in the Hotel del Coronado’s Crown Room at the 2016 Black and White gala. 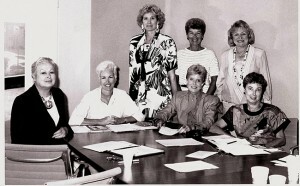 Committee members of the first hospital gala, held in November 1988 to celebrate the hospital’s upcoming Golden Jubilee year included (from left, standing) Vicki Beaubien, Mary Herron, Mary Sandermann; (from left seated) Jean Hashman, Sharon Considine, Celia Smith Rennie, Diane McQuilken. 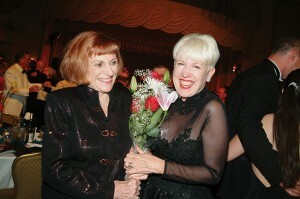 Mary Sandermann and Sharon Considine have chaired the majority of Sharp Coronado Hospital’s galas. 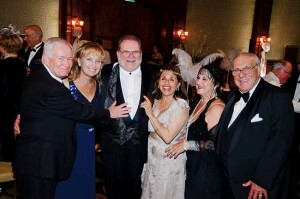 Dean and Nancy Eckenroth, Charles and Linda Hayes and Maria and Carl Caccamise have enjoyed many of the hospital balls. Sharp Healthcare’s President and CEO Mike Murphy, seated third from right, is a regular attendee of Sharp Coronado Hospital’s galas.